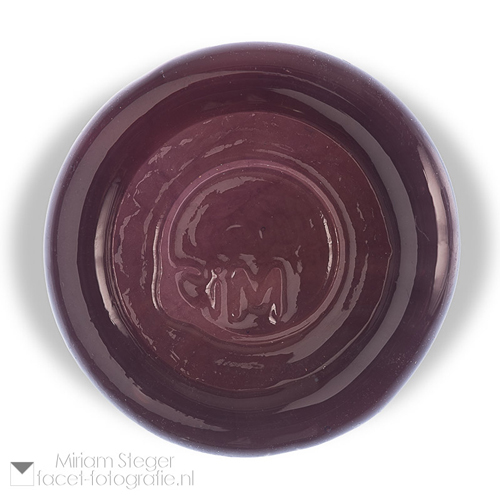 511616 - BUY NOW All Messy Colors available at: ..... crea-arte gmbh (, Switzerland) ..... Ed Hoy's International (IL, USA) ..... Frantz Art Glass (WA, USA) ..... Tuffnell Glass (East Yorkshire, United Kingdom) Most Messy Colors available at: ..... ABR Imagery, Inc. (IN, USA) ..... AniBeads (, Germany) ..... Artisens Studio (, Hong Kong) ..... Artistry In Glass (Ontario, Canada) ..... Artyco (, Netherlands) ..... Bead Glass (NSW, Australia) ..... beadbox.de (, Germany) ..... Beadpress (, Netherlands) ..... BerlinBeads (, Germany) ..... Flamedame.com (FL, USA) ..... Glasgestaltung (, Germany) ..... Glasperlenkunst / La Casita Bolita (, Switzerland) ..... Glassworks France (, France) ..... Howaco Glass Supply Co. (MI, USA) ..... InsideColors (, Russia) ..... L'Age du Verre (, France) ..... Moretti & More (WA, USA) ..... Neus Shop GmbH (, Switzerland) ..... Nortel Manufacturing Ltd. (Ontario, Canada) ..... Ombos Arts & Beads & Crafts (, Germany) ..... Studio 34 Creative Arts Learning Center (NY, USA) ..... ООО «АРТ-ЛЭМПВОРК» (, Russia) Visit our complete reseller listing. Click here for other interesting Coronation Day Ltd Run discoveries. 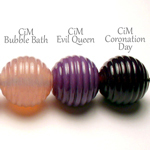 "Coronation Day is only sort of transparent on the rod but loses transparency when torched." 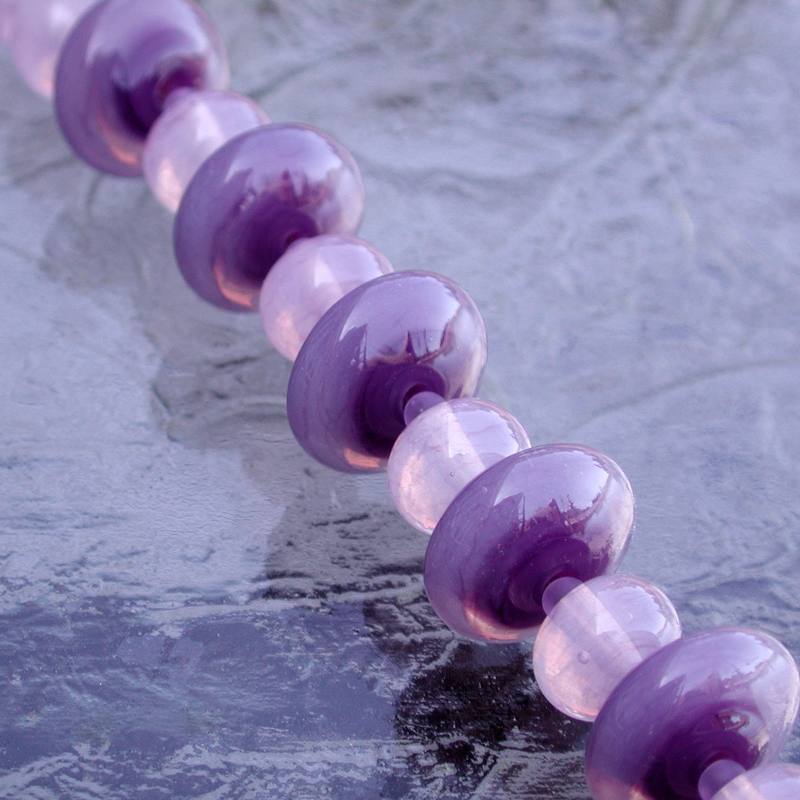 "Coronation Day - a royal purple that is lighter and streakier than the rod itself. 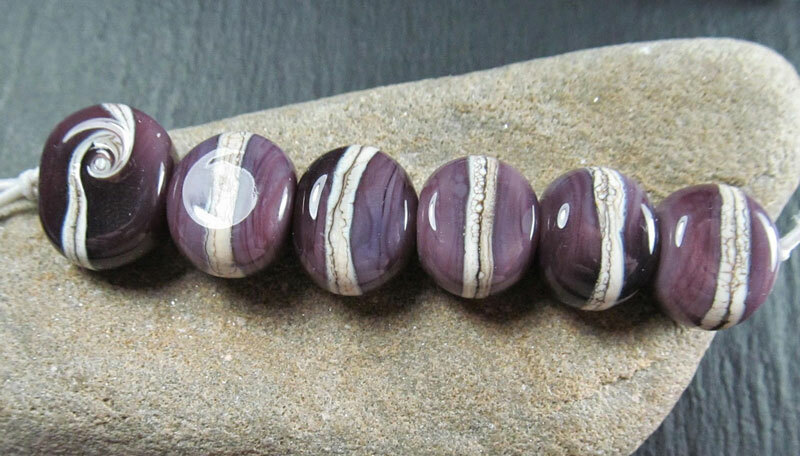 The two beads on the left are self coloured, and the one on the right, I applied white dots and then super heated it and swirled them into the purple base." Read more at DragonJools' blog. "You may be able to see here – the feet and bottom lip have opacified and lightened more, while the top stayed darker and more translucent. 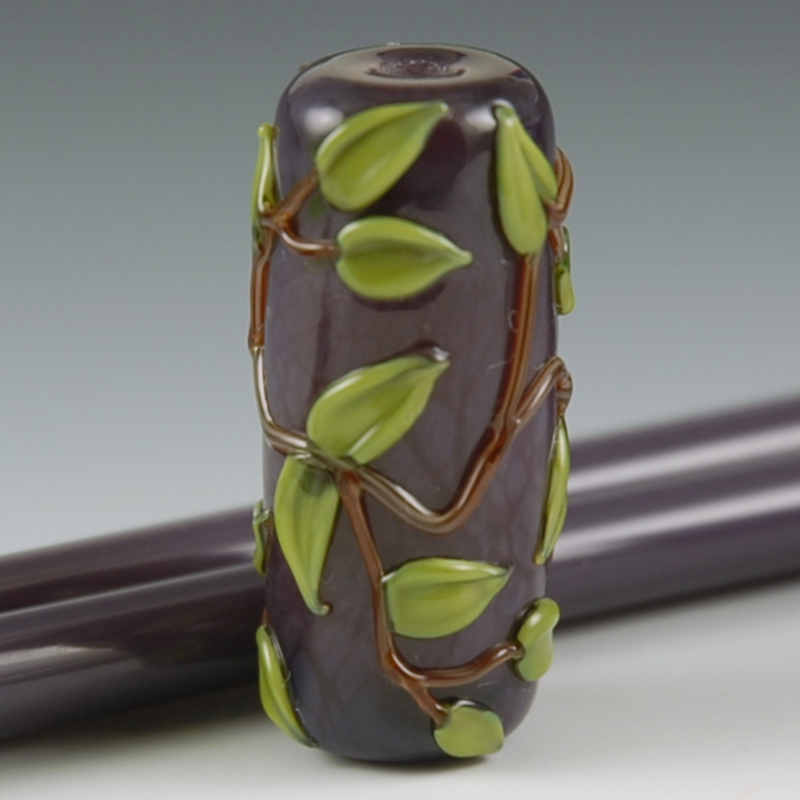 This is the same thing a lot of the CiM opals do, and depends on how much heating and cooling they get after the last time they were molten [and maybe on kiln position too]." Read more at Heather's blog. "Coronation Day is a deep, rich lilac. The depth of color is hard for the camera to accurately capture. 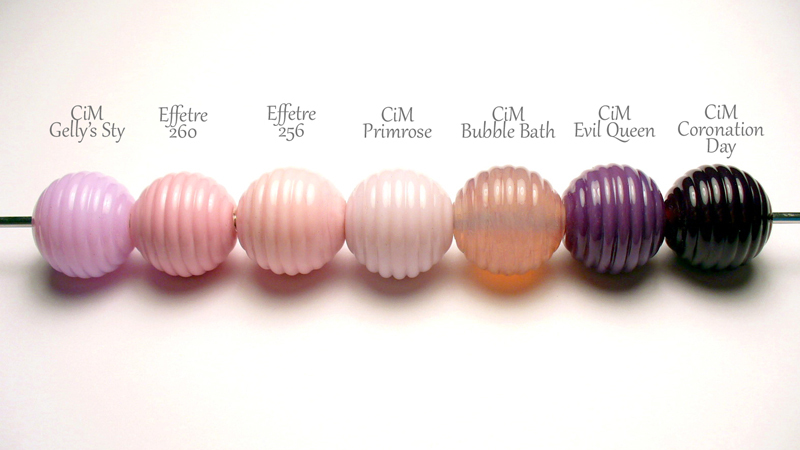 Using a variety of flame conditions will produce highs and lows in color gradient. 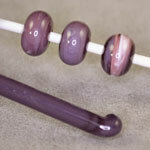 A thorough flame polish is recommended for an overall deep purple hue. Repeating heated and cooling will lend to more variety of highs and lows. 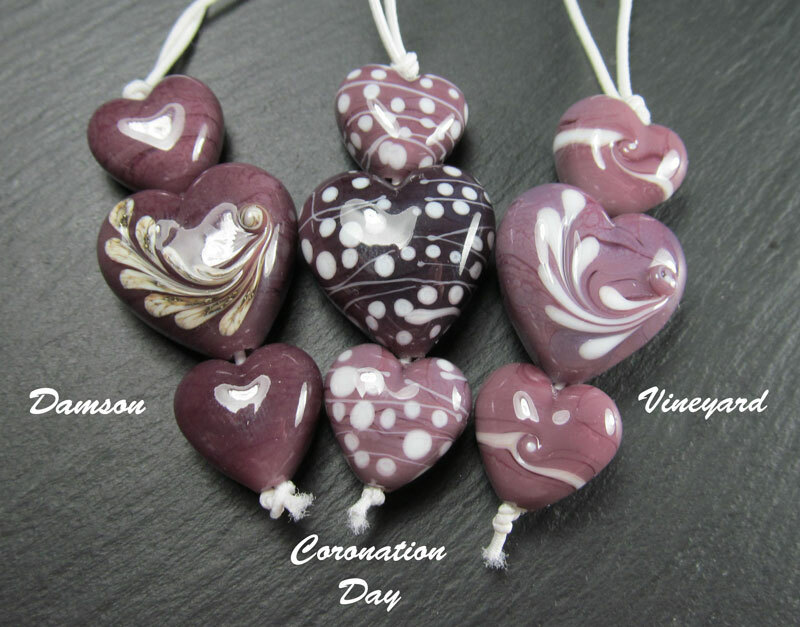 Working the molten glass with a cool shaping tool will also achieve variations in the rich tones of Coronation Day." 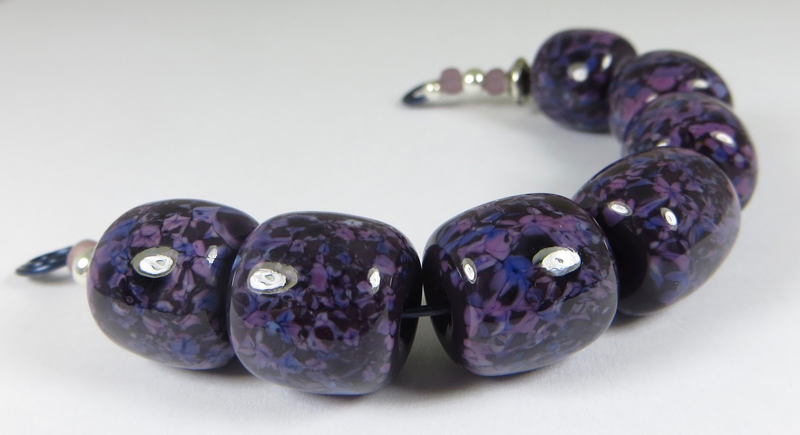 “The very first beads that I made with this glass showed heaps of colour variation - all of which are beautiful shades of dark lilac to rich purple - considering they were all made with a single rod of glass this variation had me intrigued. . . . 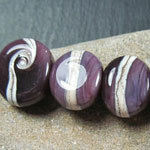 I did manage to reproduce a similar effect again though in making this sweet set of tab beads. 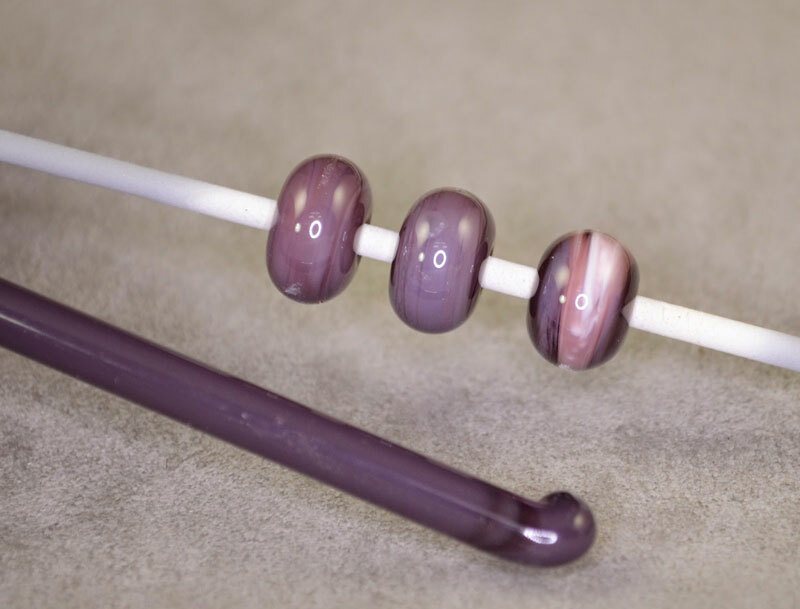 They were put through several cycles of heating and rapid cooling by using a heavy brass parallel press which seems to be the secret to teasing out the darker opal purple tones. The effect is so pretty!” Read more at Kitzbitz Art Glass’ blog.